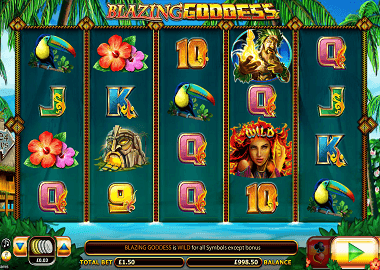 The Blazing Goddess Slot by Lightning Box Gaming is the perfect slot for island hoppers. A dream island, beaches, coconuts … who does not want more? We hope you want to play Blazing Goddess – you have the best opportunity here on our site. The Lightning Box slot also has a special feature: you do not play with playlines here but with ways to win. The difference is that at Ways to Win slots the symbols just have to end up side by side on the reels. You get more smaller winnings and for that reason you should play the slot with higher bets. But more on that later. The symbols on the Blazing Goddess are the playing cards symbols 9, 10, J, Q and K. There is no Ace in this game. The themed symbols are flowers, a bird, a burning cave and a priest. The Blazing Goddess itself is the most valuable symbol and at the same time your wild symbol. It replaces every symbol except the Scatters and also generates decent profits in the base game. There’s a good reason for that too, because when the Blazing Goddess shows up on reels 2 or 4, your winnings will be doubled! The free spins on the Blazing Goddess are sure to be the highlight. Your free spins are triggered with 3 scatter symbols. You will then randomly get up to 30 free spins and another feature. Just like in the base game, the Blazing Goddess symbol is your Wild symbol. In the Free Spins feature you still get an additional wild symbol. Fireballs land on your reels which, in combination with the Blazing Goddess symbols, deliver top results! So look out for the wild symbols and the free games feature will reward you richly. As we mentioned earlier, Blazing Goddess is a Ways to Win slot. You can not choose paylines, you always play with all possible winning combinations. The minimum bet is £0.50 per spin. Of course, the winnings are then correspondingly small, so you should play more bet per spin. The maximum bet is £100 – so this game is perfect for high rollers. The return to player is 95.39%. The Blazing Goddess Slot is an all around good game. The most exciting thing is the Free Spins feature with the extra wilds – here you can clear very big winnings. You can play the Blazing Goddess without any problems if you click on the picture above. Lightning Box slots are compatible on all platforms. This means that you can also play from your smart phone. If you want to play the Blazing Goddess slot with real money, you can do that in the online casinos below. There are also very good bonus offers and also bonus spins without deposit.